Wow! 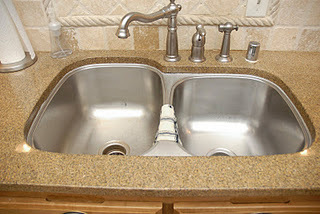 I continue to have so much participation in the Organizing Your Kitchen Challenge, week 1, where we worked on clearing clutter from our kitchen counters and keeping our sink clear. Here are even more submissions from readers (part 3 in fact!) 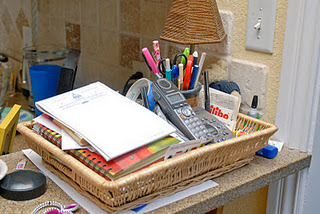 who have taken this challenge and conquered their counter clutter! I continue to be so impressed with everyone's great results, and I think these before and after pictures are a great motivation to continue on. 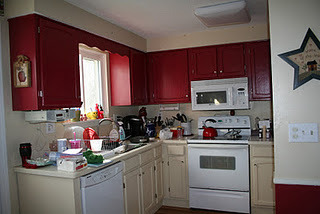 If these pictures inspire you, you can take the steps in the Kitchen Organization Challenge too, and share your own results with me. 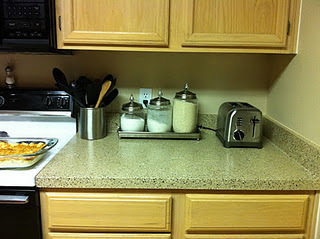 Jane shared her wonderful results from the Organizing Your Kitchen Challenge, week #1. After assessing my countertops and all the clutter, I was even more motivated to clear the messes and organize my counters better. I don't have much counter space to begin with and looking at everything that was on them, I knew I had to remove nearly everything. I bought a small bookshelf to sit under one of the windows that now holds my cook books, recipes, the toaster and the fryer since I don't use these everyday. I have always wanted to get my storage containers off my counters to free up more space, so I am buying storage containers that will fit in my cabinets and pantry better. 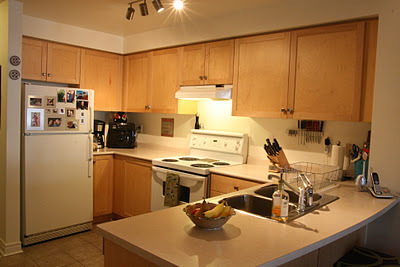 I haven't found a place for my griddle yet, but I will as I declutter and organize my cabinets. Now I have even more space for food preparation. 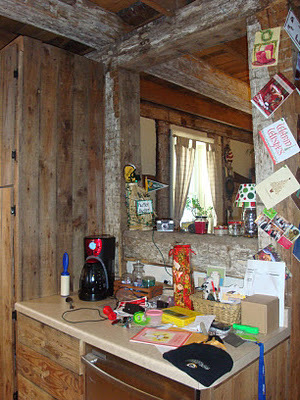 I am really encouraged by the feeling of a new year and fresh start to my year long journey to a more organized house. Thank you! Thanks for sharing your pictures Jane. You did great in week 1, and it sounds like you're ready to dive into Week #2, Kitchen Cabinet Organization next. 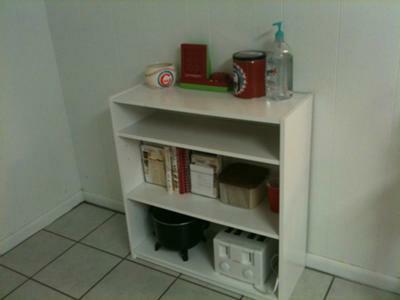 I like how you thought out of the box, and determined what would fit well in your kitchen space, with the bookshelf. 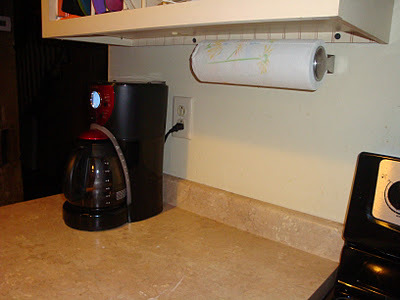 That is a great way to add storage space and clear counter space at the same time. 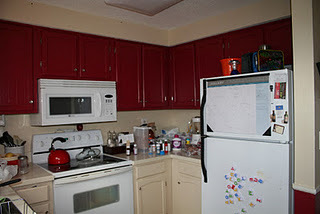 Kathleen from Life with the Z's shared some wonderful before and after pictures from the first week's Organizing Your Kitchen Challenge on her blog, and I honestly had a hard time choosing which ones to share here since they all were so good. (Make sure to check out the rest of them on her blog.) 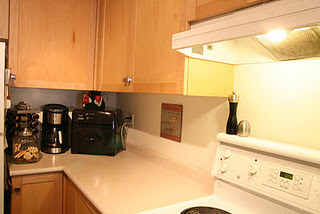 Each of the pictures shows a great storage solution that she installed herself which cleared space on her kitchen counters. 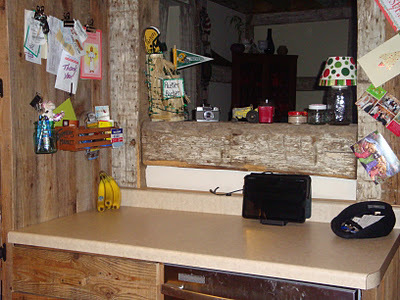 The first after picture shows how she cleared space on her counters by utilizing wall storage, since she mounted both the wooden rack, and also mounted a mason jar to hold her pens (how cute!) (She got that idea from Pinterest -- love that site (so follow me!) :) In addition, she mounted a clip for each person in the family to hold papers and things for them. It looks good, and she said it was quite inexpensive at Walmart for the supplies for that! Awesome. 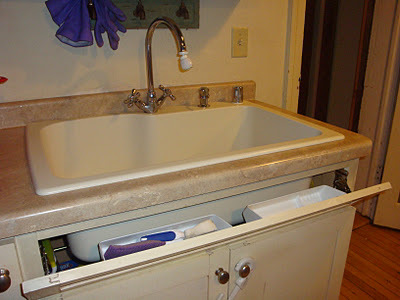 Then, she amazed me further by installing a tip out sink tray to put her sponges in (it also holder her rings while she does dishes -- again, awesome) and a soap dispenser for the sink. (You can see a similar item I found on Amazon on the right). 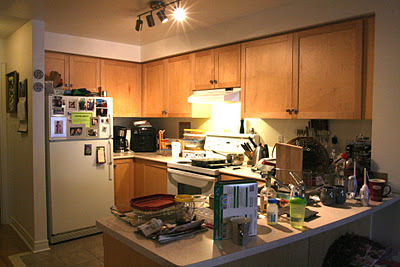 Jennifer at Life of Reilly also did the first week's challenge of the 52 Weeks to an Organized Home, and shared her before and after pictures on her blog, and also graciously shared them with me. 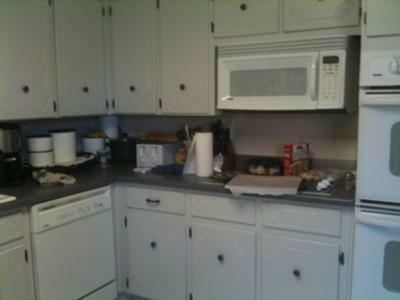 Thanks for sharing your before and after pictures for the Organizing Your Kitchen Challenge Jennifer! I have accomplished the first task! 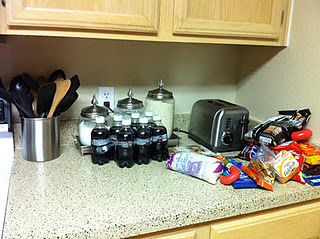 Our counters seem to be the place that collects all of the junk that we have/get. Here is the link to my blog post... Moments Like This. Thanks so much for sharing your pictures Allison. In her blog post Allison shares that "Our big problem is letting things pile up such as mail, receipts, and other junk." 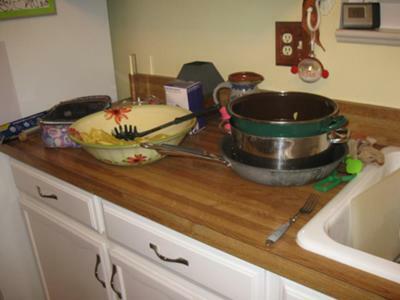 I think lots of us can totally relate to that issue, because it seems like the flat surfaces of our kitchen counters just invite you to lay down stuff you've got in your hand and haven't really considered where else to put. The nice thing she reported was that "Cleaning them off/up only took me 20 mins." 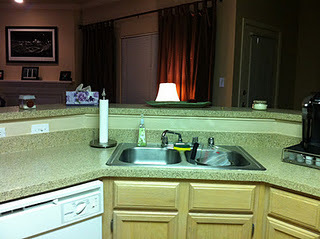 Plus, her new mantra is that "The counters are not a dumping ground!" I like that! Keep up the great work Allison. Karen sent these pictures to me through the Home Storage Solutions 101 Facebook wall, and they are definitely deserving of the Kitchen Organization hall of fame, aren't they? You did an awesome job Karen! 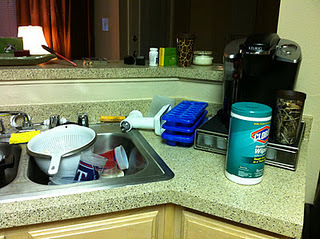 Brandy from Yarnie Tails took the challenge to clear her kitchen counters and shared her photos on her blog, and also with me. 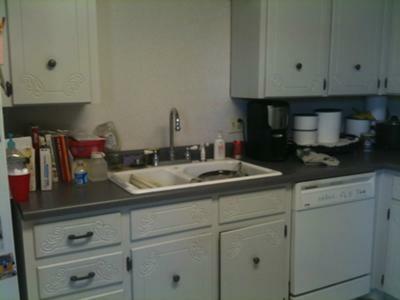 She said that her "kitchen has become a catch all" and people were putting stuff in there. That's why, as part of this challenge, she instituted a new rule. The rule "is as soon as you get done making something put everything away. 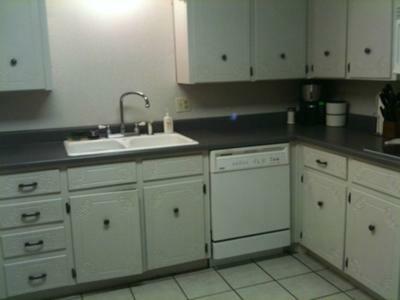 That is including dirty dishes." That rule may seem more about cleaning, than organizing, but I totally understand where Brandy is coming from. 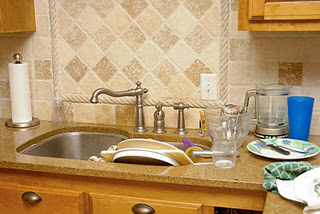 When you let stuff like dirty dishes pile up (too long) in the sink or on the counters then it's like an invitation to put other junk on them too. 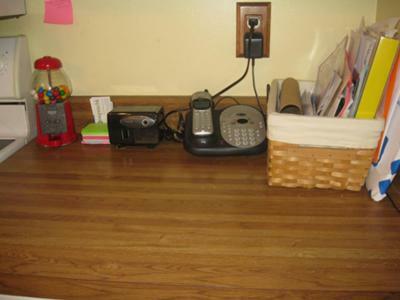 Constant vigilance can be required to guard your clear counter space, since it seems like a clear counter is an open invitation to lay stuff down on it. However, keeping it clear really can give you such peace of mind it's definitely worth it. Thanks Brandy for sharing this on your blog, and participating in the challenges! 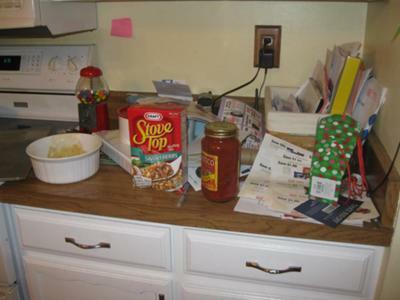 Cindy from More Like June took up the challenge of organizing your kitchen and conquered it! Her before and after pictures are great. She really cleared off a lot of counterspace so she can spread out for cooking more. 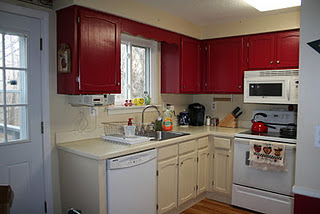 Cindy felt like this was the perfect way to start the 52 Weeks to an Organized Home Challenge, since the kitchen really is the heart of the home. She said, "We clean each night but only to the road block. The clutter. But what I love is that we now have a beautiful clean base to work from. And I know we can keep it up." I think you can too Cindy! Those are some great pictures, so thanks for sharing them. Susan at the blog Camp Slinkard shared her before and after pictures from the week's challenge. She focused on her two big problem areas, the phone center and the sink. I love how she considered the function of the phone center, and made it less cluttered so it worked better for that function. 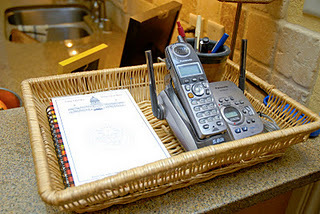 When you look at the after picture of the phone center you'll even see that she has made it handy to take notes from phone messages, with a pad of paper and some spare pens. Great thinking ahead Susan! 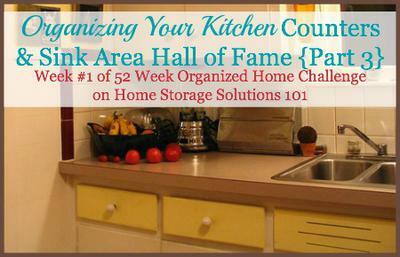 Do You Want To Be Included In The Organizing Your Kitchen Hall Of Fame? 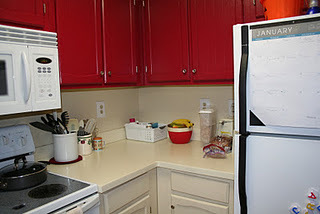 This is the third hall of fame post for this first challenge of the New Year in the 52 Week Organized Home Challenge all about kitchen organization. I hope these before and after photos and ideas from real readers have helped motivate you and get you in the mood to take on this challenge. If so, I'd love it if you shared your results with me too. You can submit your accomplishments to the Creative Storage Solutions and Home Organization Hall of Fame and get yourself featured too! Love this. My kitchen has never had any appliances coffee maker, can openers, jars etc... and I love it. clean and clear. The only thing on top of my counter is the Microwave and that is it. I love it this way it appears more clean without the extra clutter.Thanks for sharing.